When the Carrie Haddad Gallery opened in May 1991, it was the only art venue in Hudson. As of last year, there were 32 galleries in the city. "When we first started, probably the most expensive piece we had was $500; now it's the least expensive piece we have!" Haddad laughs. She helped found the yearly ArtsWalk in 1992, which installed art in storefronts up and down Warren Street, many of which were empty. The festival would spill out into the street itself, where local kids would draw portraits of visitors for a dollar. "The ArtsWalk really helped dispel the fear that Hudson was dangerous," Haddad remembers. Haddad reached the art world by a circuitous route. Born in San Francisco, she studied dance, touring with the Stanze Peterson Dance Theatre. Haddad arrived in New York City in 1973, "to become a famous dancer," also working as a model and an actress. Then she married, had two children, and moved to Red Hook, her husband's hometown. Her first commercial venture in Hudson was an electrical supply company, which she started with her brother-in-law. "It was definitely not for me," she observes. Hudson has changed dramatically since the gallery opened. "In 1991 there were a lot of bars and whorehouses," Haddad recalls. "When we first started sending out press releases, the Register-Star wouldn't print them." Luckily, interior designers shopping at the local antique shops were also looking for paintings. Hudson's gay community expanded in the `90s, partially attracted by the historic architecture. "We call it 'a college town for old people'—except now we have a lot of young people, `cause they got kicked out of Brooklyn." (Many of the newcomers, in fact, are artists.) When Haddad's gallery opened, there were only two restaurants in Hudson; now there are 25. Leigh Palmer's "Opening No. 54"
Ten years ago, Haddad herself moved to Hudson. About five years ago, she began opening her gallery seven days a week. "I think everybody here who has a business should be open every day—not just CVS!" she remarks. Around the same time, Haddad became affiliated with the website 1stdibs.com, enabling her to sell to collectors in Russia, England, South Korea, and Saudi Arabia. Haddad has a genuine, informal style. Recently, she asked to see a price list in a gallery on 57th Street in Manhattan and was subjected to an interrogation by a gallery official. "We don't do that," she remarks. "If someone wants to use the bathroom, we let them!" Though Haddad is not actively seeking new artists, she makes a point of visiting the website of any artist who approaches her. "I owe it to them to look at their work, and respond with a comment. And sometimes I end up falling in love with their work, and I do show them." The current exhibit "Point of Intersection," celebrating the gallery's 25th anniversary, features four artists working in different media. Scott Nelson Foster paints minimalist black-and-white watercolors of small-town streetscapes. Dai Ban makes angular off-balance sculptures. Christopher Engel produces colorful abstractions resembling aerial photography. Paul Chojnowski creates figurative "fire paintings" on plywood with a blowtorch. The gallery's second floor displays a selection of photography. Most of Haddad's artists live within 50 miles of the gallery. "I like the sensibility of Hudson Valley artists. I find an optimism in their work that I don't necessarily see in someone living in Manhattan. You're not going to find someone making Piss Christ here," Haddad says, referring to Andres Serrano's notorious photo of a crucifix in urine. 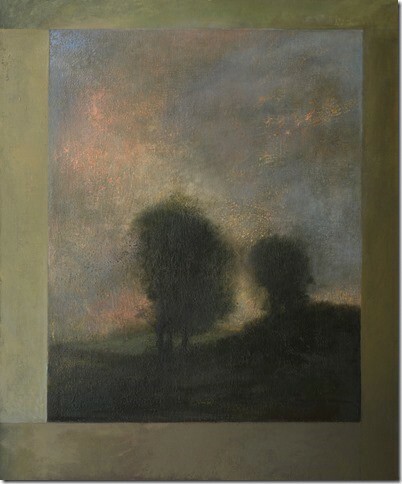 "Point of Intersection" will be at the Carrie Haddad Gallery in Hudson until May 22. (518) 828-1915.